We, the undersigned civil society organizations in Armenia, would like to bring your attention to the political situation in Armenia that is a clear confrontation between the existing autocratic corrupt regime and the hope for democracy. Until 2015, the Republic of Armenia had a semi-presidential governance system envisaging direct elections of the president of the country with maximum two terms of service. To maintain power after the expiry of his two terms, President Serzh Sargsyan changed the constitution through a largely rigged referendum held in December 2015. According to the new constitution, Armenia’s governance system changed to a parliamentary one. This provided for a stable majority of one political party in the National Assembly, eliminated direct elections of the head of state and diminished the powers of the president, transferring the major authorities to the prime minister elected by the parliamentary majority. Apparently, the new constitution was tailored to strengthen the predominant position of the ruling Republican Party of Armenia and to keep Sargsyan in power as a ‘super’ prime minister with extended authorities and diminished accountability to both the parliament and the citizens. In the parliamentary elections of April 2017, characterized by widespread vote-buying and controlled voting as well as by the absence of a strong opposition, the Republican Party of Armenia won the majority of seats in the National Assembly and set the stage for Sargsyan to appear in the state leader’s role for the third time. Starting from mid-March 2018, civil society groups started a campaign to oppose the potential nomination and election of Sargsyan as the prime minister to prevent Armenia from turning into a life-long dictatorship, a common trend in former Soviet countries. The protests were started independently by different groups, particularly the “Civil Contract” political party, “Reject Serzh” and “Armenian State Salvation Front” civic initiatives, and quickly attracted the wide support of the Armenian people. Dissatisfied with 10 years of governance by president Sargsyan, tens of thousands of citizens took to the streets. Since April 13, for several days and nights, protesters occupied France Square in central Yerevan and peacefully marched through the streets, squares and bridges, paralyzing the traffic in the city and temporarily occupying government buildings in order to influence MPs and prevent their vote in favour of Sargsyan’s candidacy. Surrounded by police cordons, heavy riot police machinery and barbed wire, the Armenian parliament elected Serzh Sargsyan on April 17th as the new prime minister with the simple majority of open-cast votes. Tens of thousands of citizens were demonstrating outside the police cordons. In response, police employed the “special means” of smoke grenades, injuring 46 people. At least 60 protesters were attacked, beaten and taken to police stations in the morning and kept there until the end of the session, thereby breeching the law on public assemblies. We note that this is the third time that Serzh Sargsyan has taken the highest position of the state in a situation of turmoil and police violence towards peaceful demonstrations. Following Sargsyan’s election in the National Assembly, the leader of Civil Contract, MP Nikol Pashinyan made a call for non-violent civic disobedience throughout the country. This echoed not only in Yerevan, but also in other cities and towns, such as Vanadzor, Gyumri, Armavir, Gavar, Hrazdan, etc. Many thousands launched peaceful demonstrations against the prospect of the consolidating dictatorship. In response to the peaceful protests, the Armenian police has applied disproportionate force and extreme violence. Within 5 days more than 600 protesters, including minors, have been attacked, severely beaten, taken to police stations and detained, often for more than 3 hours without investigative or judicial proceedings. Many protesters and, particularly, school students have been severely beaten and arrested by police officers in civilian clothes without identification badges. Police attack and break the cars of people who join the protests by honking. Journalists are increasingly being subject to violence by police. The situation escalates every moment. In parallel with their brutal treatment of peaceful protesters, the police have demonstrated surprising tolerance towards and cooperation with the organized criminal groups. There have been cases when dozens of policemen calmly witnessed the provocation by a criminal mob in the street engaged in the violence and damage of public property, disregarded multiple cars without number plates in the streets and the brutalities of criminal bands towards the people. Multiple criminal charges are being brought against the peaceful protesters, and, interestingly, there is no proceeding launched against the criminal groups. While the civic disobedience is largely led by an oppositional political party leader, the movement is non-partisan. Its main purpose is to prevent Sargsyan’s third and life-long term as the leader of the country, which would leave the country in the long-term catch of dictatorship. 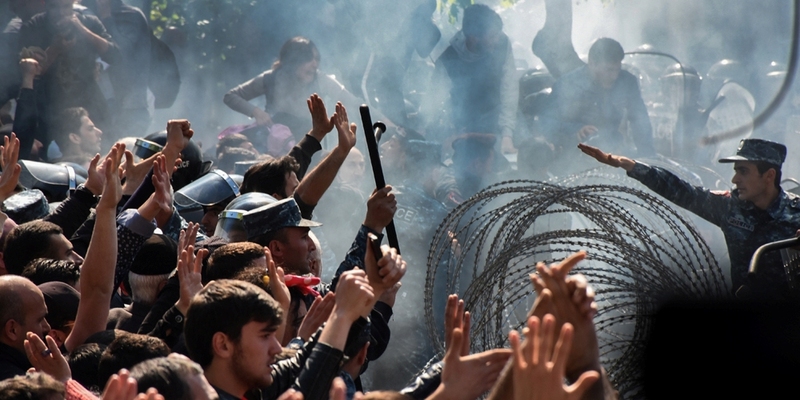 According to a recent Freedom House report, Nations in Transit: Confronting Illiberalism, Armenia’s democracy score is sliding and has put the country within the group of semi-consolidated authoritarian regimes. Hence, Armenian civil society organizations have launched a petition with a demand for Serzh Sargsyan to step down. Whatever happens in Armenia, it is a fight for democracy, and fight against the corrupt regime. This current outburst of energy is the consequence of citizens’ political rights continuously being suppressed since 1995, and a firm demand to express people’s vote in free and fair elections. We call on international organizations and countries that promote democratic values and systems to support the struggle of the Armenian people for a better future. Life-long dictators must not be recognized and must be condemned by the agents of democracy. Freedom of peaceful assemblies shall be protected by the Armenian state and any escalation of the situation and the consequences are the responsibility of Serzh Sargsyan.